The historic and spectacular Boone Creek gorge is a privately owned natural wonder previously inaccessible by the public. Boone Creek Outdoors is located along the west side of Boone Creek in Fayette County. We have many sites to see including an open meadow, steep limestone hillsides, a waterfall, and Boone Creek gorge. Historically, this land has had many commercial uses such as a gas station and truck stop in the 20th century and a toll house in the 19th century. In 1994 the property was listed on the National Register of Historic Places by the Boone Creek Historic District. 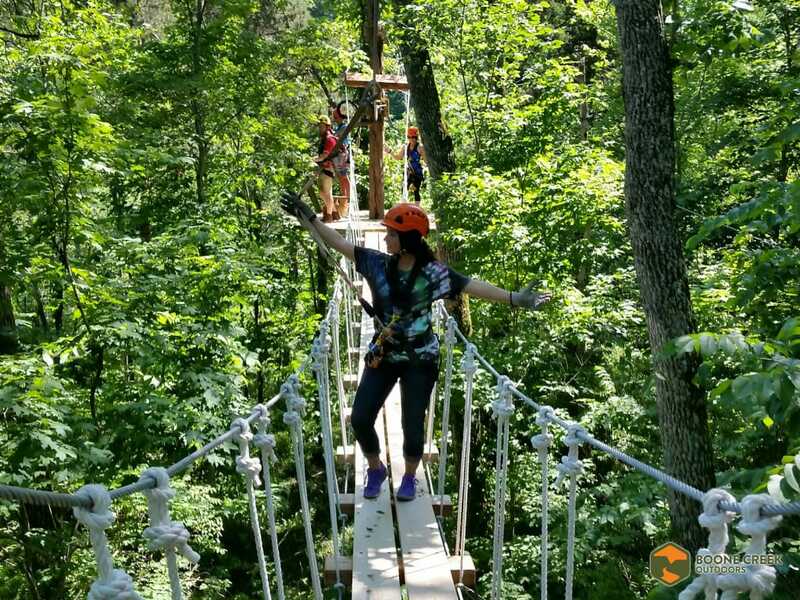 Our Zip Line Canopy Tour was created in an effort to preserve and conserve the forest we hold dear. Boone Creek Outdoors provides wider access for the public to experience an unspoiled natural resource in an educational, thrilling, and minimally invasive manner. Help us remove the infamous winter creeper and honey suckle – earn a free Zip Line Canopy Tour or guided hike! 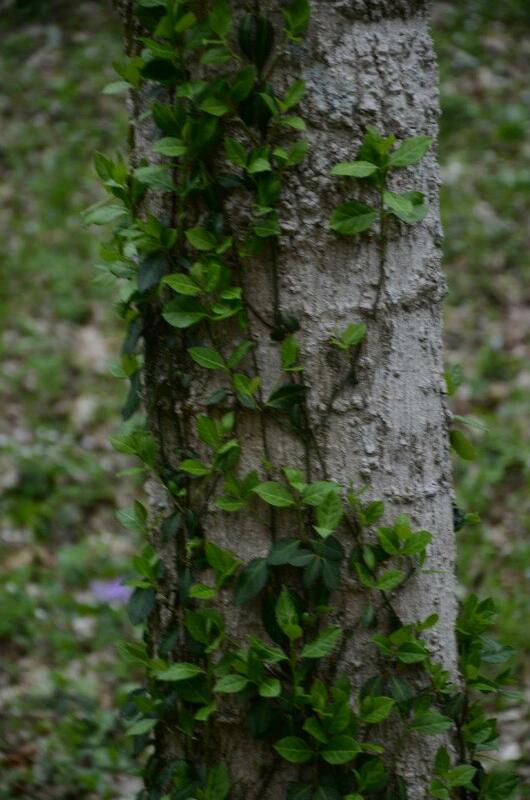 Introduced as ground cover, the creeper has become one of the least wanted plants in the US. It thrives in practically any condition, invades natural openings, covers the ground and vegetation, eliminates native ground cover species, and has potential to seriously degrade otherwise undisturbed forests. An aggressive approach must be taken to remove winter creeper in ecologically sensitive areas. Since the vines strangle trees, we start removal at the tree trunk and work our way out. We have fun out here in the forest! A big shout out to Mellow Mushroom for letting us set up camp at the first ever Mellow Market! Craft vendors, live music, cold beer, and trivia… What more can you ask for on such a fine day in the Bluegrass? We asked these market goers a few questions about Daniel Boone, native KY trees, and more! Think you got what it takes? Catch us July 22nd from 6-10 pm and win some free merch! In our modern society, plastic razors, cups, bags, packaging, and more have become common place. Convenience has ruled the past few decades as single-use items saturate the shelves of supermartkets. Several environmental health issues stem from leeched toxins in our soils, waterways, etc. Even properly disposed trash in landfills requires careful monitoring to ensure hazardous chemicals do not enter surrouding areas. A simple way to live sustainable is investing in reusable products. When you make a purchase, consider the item’s life expectancy: How long can this item be used? Will it have more than one use? Am I able to reuse or recycle this product after it is used? Take a minute to think of the products you throw away most often – what alternatives are available? We dig this new alternative to plastic cling wrap – Bee’s Wrap! It is reusable, recyclable, biodegradable, and plastic free. Stay tuned for our official opening date!